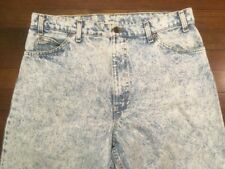 These mid80s Levi’s acid wash zipper fly 550 denim jeans are in very good vintage condition. They are structurally 100% sound. There is some light yellow discoloration spots on the inside. Actual waist and inseam measurements are 35 by just over 31 inches. 550 levis of this time are big up top and taper down considerably. They wear baggy but won’t go under your sneaker even if long on the inseam. See pictures for details and measurements. I have not laundered this item. Outseam, waist to cuff - 36”. These jeans features a classic rise, five pockets, zip fly with button closure, and a relaxed fit with straight cut legs. Bold looking buttons, rivets and contrast stitching throughout. LEVIS 517 Vtg Late 80's Orange Tab Made in USA Jeans 2 tone double felled inseam. Original riveted blue jeans. Orange tab. Orange stitching. Style is 20517-0217. Nice natural wear and aging. -Color: faded maroon! These are original Levi's orange tab jeans from the 1980's, in super soft denim, well worn and faded, with zip fly. Made in USA, 100% cotton, machine wash warm. Fabriqué aux USA, 100% coton, lavage machine à chaud. No major flaws. No holes, stains, tears, or repairs. Inseam: 27. Vintage 1980’s Levi’s orange tab 550 relaxed fit tapered leg denim jeans. Size 33 x 32. 100% cotton. Made in USA. Pre-owned condition showing wear. See pictures for detail. Nice worn in look and feel! Actual measurements 32” waist, 11” rise, 31” inseam, 41” waist to hem length. Solid 1980s Orange Tab Levis. See photos for condition and size. Labeled size 42x34. They do show tons of wear and have a great look. Decade 1980s. Color Dark Black. Material 100% Cotton. Light Discoloration On Front Leg. They have a Levis zipper and straight legs. The leather patch is coming loose, and they are a few light fade spots on the bottom of the legs. Inseam-32 1/2". USA Made. Tagged 32/34 but measures 31/31.5. The waist measures about 31 inches in diameter and length of the inseam is about 31.5 inches long. The front panels are a thick duck cloth canvas. The back labels and tabs have wear throughout. There are areas of fading and discoloration throughout. PLEASE SEE THE PICTURES AND PLEASE ASK ANY QUESTIONS BEFORE BIDDING ON THE Jeans. Jeans style. Soft 100% cotton. Feels more like a flannel than denim. Zipper fly. Rise (crotch seam to top of waist) is 14". Guesstimate late 1970s (maybe very early 1980s.). See all pics for details & enlarge each pic for a closer look. Any spots/stains/soiling (note the bleached spot in front to the left of fly), fading, wear, fraying or anything else is to be considered character of previously loved jeans. 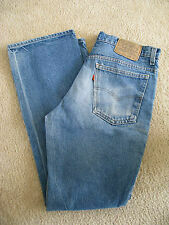 Men’s Vintage Levi’s 550 Relaxed Fit Blue Jeans, Size 29x34. Judging from the rivets, patch, inside tag, and orange tab, these jeans were made between 1988-1992. Fair cosmetic condition. Light fading, some fraying on hems and waist, a small hole (~ 1/2”) on front leg, and a couple small stains. Please reference photos for accurate condition. MEASUREMENTS Tag: 29 x 34 Waist: 29” Rise: 12” Inseam: 33” Waist to Hem: 42” Item will ship next day, Priority Mail, tracked and insured. Estimating late 70s or early 80s for these. These are zipper fly. Waist: 16" (32" around, un-stretched). Doing that is against U.S. and international laws. Inseam Length: 31". Therefore, many of them will show light signs of wear. Fantastic pair of original Pepe Jeans. Great for current retro look or just because you like orange jeans! Adult 29x34 (acutal 26x31). Talon zipper. No pocket watch pocket or rivets. DENIM - ZIP FLY - ORANGE TAB. Length has been professionally altered. It may show signs of very minor wear and use that does not affect presentation or function. 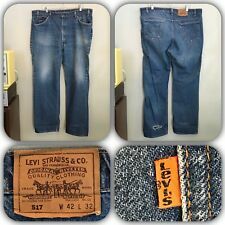 These jeans are by Levi Strauss and are a size 38 W x 31 L. They are style 508. There is some slight wear at the hems (see photos). They are faded and worn but it overall excellent vintage condition. They measure 37 inches at the waist, 42 inches at the hip, and 41 inches from top to bottom, with a 12 inch rise and 30 inch inseam. Please contact me with any questions and take a look at my other items!